Comeback Program is an offer to employment agencies, social services, youth centres, municipalities and institutions, that meet the young men who have trouble navigating in their own lives and the law. The target audience is boys and men between 16-35 years, who might have extensive and complex psychosocial difficulties. Difficulties like; drug addiction, crime and a very externalizing behaviour. We meet them in their environment – where they live and socialize. Usually the young men come from criminal gangs. The street and the roles that follow, have defined their lives and they therefore have difficulties adjusting to the rules and traditions of the Danish society. We offer a community much like the one they know from the street, only ours have constructive values. The young men get to know themselves, take personal responsibility and develop their own social competences. They also learn to adapt their resources so their life won’t be as hectic for them, their families and their surroundings. They’ll get their life back on track. We don’t tell them what to do. We use a method driven by curiosity and understanding, where we offer them concrete tools like addiction therapy, motivational dialogues and other techniques that helps them manage the feelings and thoughts they might struggle with. Those feelings and thoughts can be stress, frustration, hopelessness and insufficiency. They also get the help needed for them to get their life back – for instance through clarification and an action plan for the future. The program is established around four phases, where 13 weeks of the program are mandatory. We work holistically with the individual’s challenges. It’s done through dialogue, classes, physical workouts and workshops. Creating a daily routine parallel with the program, gives the young men the perfect foundation for development. We do this by having a daily check-in and -out, with regular meals and a permanent frame for the mentoring. The program starts as a dialogue between the individual, his assigned social worker and us. This dialogue lays the foundation for the pedagogic screening and a work- and educational assessment. The last part of the first phase is a follow-up interview with the employment services and the individual. After completing the first phase the next can start. Past experiences turn into a broadened perspective of the future. He articulates his dreams and starts planning how to realize them. There will be visits to different schools and workplaces, as well as training in writing applications for educational institutions or potential workplaces. The individual also has the possibility to start in an internship. Focus in phase 3 is on searching and establishing a good connection to the job market or potential educational programs. The young man will also meet potential employers or student counsellors. Some of the participants try out an internship at a company or test an educational institution during this phase. The young men will be maintained in either job or education, where they continuously will have contact with their advisor from Comeback Program. Often this contact means a lot, because it is a significant change in lifestyle to maintain a job or an education. The mentoring is offered on an hourly basis. We use boxing as a pedagogical tool. To become a good boxer, you’ll need discipline and courage. It’s about focus and perseverance to keep fighting until the goal is reached. Furthermore, boxing revolves around personal responsibility. It’s a mindset that helps them achieve success in society and work life. The tools from boxing and the metaphors around them, correlate strongly with life and all its struggles. We can be in the fighting zone, in the ring corner or in countdown. This metaphor is very useful for the young men, and it helps them think and learn how they respond to and manage different situations. Our primary focus is learning how they get back into the fight. 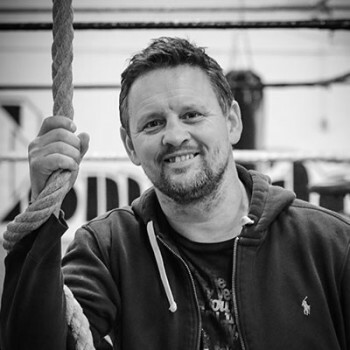 The trainer plays an important part in boxing, while in real life the counsellor plays an equally important part as a mentor and sparring partner. On a regular basis we train the individual how to get the best partnership with his counsellor and his network in general. We record attendance every day, and every month the employment services receive an attendance list of the person. We also make a status report of the individuals’ progress after each phase. The status report is the gathering point for the closing status meeting between the employment services and Comeback Program, where we focus on the individuals’ further progress. This could be getting an education, a job or moving on to Comeback Industries. Poul is the founder of Comeback. In the last 20 years he has worked and refined the target group and idea of the organisation. Poul is a an teacher with an professional education in management and criminology. He is also an previous elite boxer.